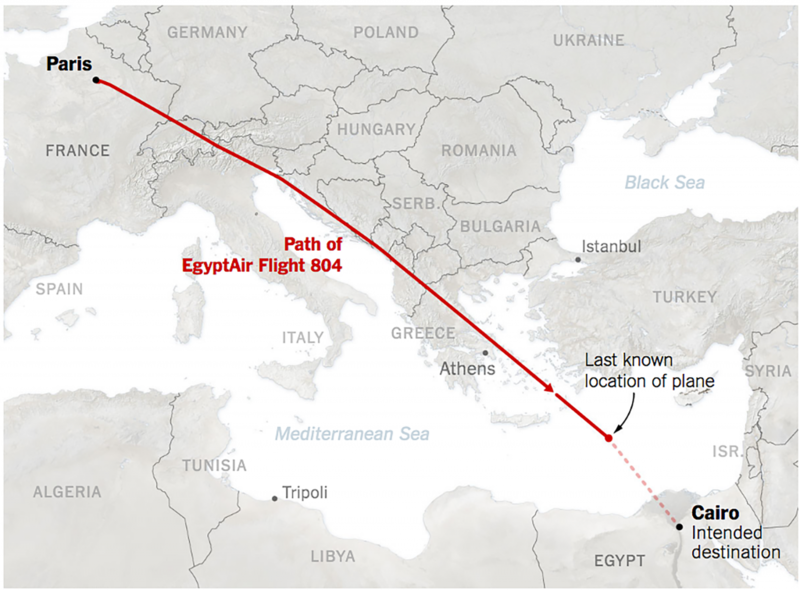 Last Thursday, EgyptAir Flight 804 unexpectedly disappeared from the skies over the Mediterranean en route from Paris to Cairo, presumably leaving sixty-six dead. Appearing on Charlie Rose shortly after news of the tragedy broke, TCF senior fellow Michael Wahid Hanna commented on then-emerging speculations that the incident was an act of terrorism. Hanna spoke specifically of the long list of security challenges that Egypt has faced in recent years, to which the crash has been added. Speaking with the New York Times and Wall Street Journal, Hanna commented further on the Egyptian regime’s reaction to the plane’s disappearance. Namely, Hanna contrasted the candidness of Egypt’s official response to Thursday’s tragedy with the regime’s reaction to the Metrojet Flight 9268 crash on October 31, 2015, that killed 224 passengers bound for St. Petersburg from Cairo. Following the Metrojet tragedy last October, Egyptian officials were long reluctant to admit that the event was related to terrorist activity, despite a local affiliate of the Islamic State claiming responsibility for the crash hours after the attack. Egypt later reversed its stance in the following months, but not without facing criticism for its stubborn conduct from the international community. “Some lessons have been learned,” Hanna said to the Wall Street Journal. But while the transparency of Egypt’s approach to this latest tragedy seems promising, Hanna warned that it could come with self-serving motivations. In acknowledging that the plane may have been the target of a terrorist attack, Egypt gains the opportunity to shift blame for the crash to France due to potential security lapses that may have occurred at Charles de Gaulle Airport leading up to the incident. Placing the blame on France doesn’t come without its risks, however, as this move could in turn alienate a country that has remained friendly with Egypt during a time when Egyptian relations with other European Union member states have deteriorated. A mounting number of challenges facing Egypt could actually ultimately generate strengthened support for President Abdel Fattah el-Sisi, despite his repressive policies and recent crackdowns on political dissent, Hanna said. Just days after the crash, Hanna’s assessment seems to already be coming to fruition, with the tragedy prompting a number of visits from U.S. officials to Cairo. “Egypt is too big to fail in the eyes of the U.S. and Europe,” Hanna said.